It was a fair weather forecast for the weekend, with the best day predicted as Saturday, So in we jumped and off we went on Friday morning. Our motorhome is set up and ready to go at a moments notice, unlike our days of touring caravanning when we first had to retrieve it from storage, bring it home, load it up.....you get the gist - it was soon placed in the "too hard to do" catagory. 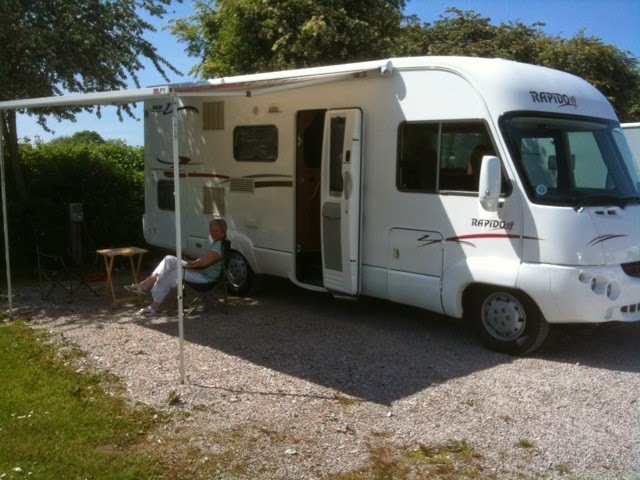 The benefit of a motorhome over a touring caravan is that it is classed as a motor vehicle, and in our case, as a Private Light Goods vehicle, unlike a caravan, which sometimes fall foul of all sorts of covenants when storing them on the driveway at home. Also unlike a caravan, as long as it is taxed, insured and MOT'd then it can be parked on the public highway just as long as it isn't causing an obstruction. (All vehicles can be said to be causing an obstruction of the highway should the police choose to do so, particularly after a complaint, but if there are other similar vehicles parked in the area, then a precedent is set and there isn't much anybody can do about it other than force them all to move on). Anyway, I diversify. 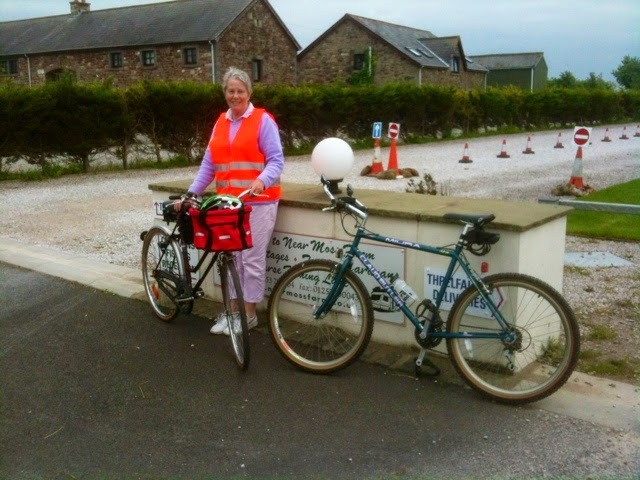 This time we chose to stay on a very small farm site located within the rural Lancashire Plain, close to The Trough of Bowland. 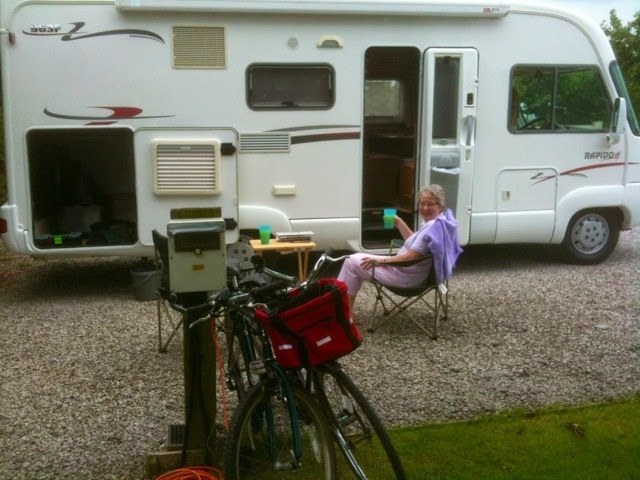 We have been able to use this site, known as a Certified Location, after we joined The Caravan Club earlier this week. CL's are small, basic sites for up to 5 units, set up by individuals who own sufficient land to offer short stays to touring units, (no storage). They are much cheaper than the average family touring site, and their facilities and costs vary. This particular one has showering and lavatory facilities as well as power and water on each pitch, so is well up there with the best. It costs £15 per night all in, which is £11 per night cheaper than the Royal Umpire where we ventured to last time. We have now embarked on a keep fit regime after my latest MOT at the Doc's, and we loaded our underused peddlers into the motorhome's large garage before we set off from home. After arriving back on site, after an initial 5 mile round trip, I wish I had opted to put the motor scoot in there though - sore bums and legs all round! I suppose we will get used to it again, after all I used to own a cycle shop, and not only entered and completed the Manchester-Blackpool charity ride 3 years on the trot in the late 1990's, I also sponsored the team I was riding for as well. I have become flabby! 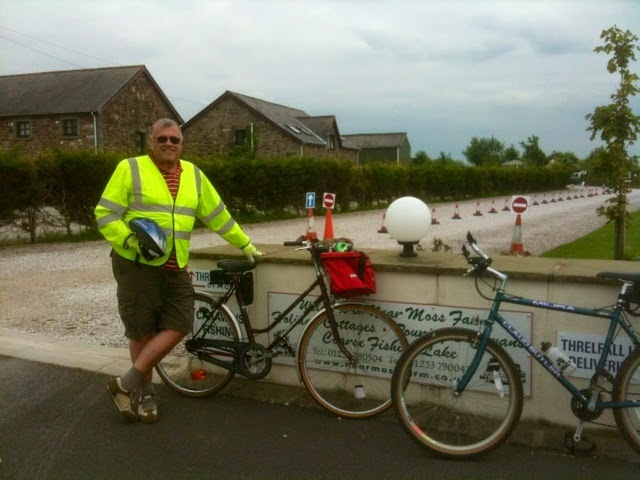 The two bikes are leftovers from my time as a cycle shop owner, but the last time I did the Manchester-Blackpool I acquired a carbon fibre sports jobby for myself to ride - and came 2nd. Afterwards I sold the (very expensive) bike from the shop window. No such luxuries here though. After settling back on site, it was time to crack out the outdoor refreshments again. this looks like being another fine weekend. This 5 CL is called Near Moss Farm, and is located between Cockerham and Pilling in Lancashire. 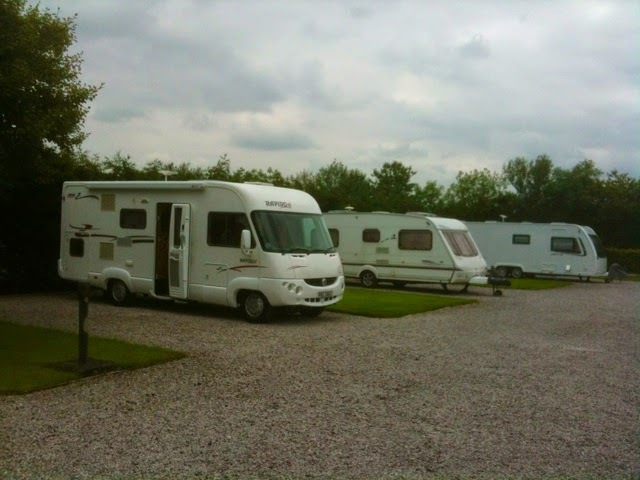 Caravan Club membership is required to use the CL. The diversified farm also operates a 60 pitch full facility adults only seasonal site here as well as a few static pitches, off limits to us tourers. For those with an interest it also has its own well stocked course fishing lake. Titanic Sinking - Survivor Interviews. Recently British Pathe uploaded their entire stock of newsreel footage to Youtube. This provides an easy to access history of world events for anybody to see, and use, such as I am about to here. Hulls float on water, and when they are breached for whatever reason, the inevitable will occur - they sink, and in the case of Titanic, became the world's worst maritime disaster. Here are interviews with actual survivors filmed by British Pathe. They provide a valuable eye witness insight into the dramatic events of that night in 1912. The Maiden Voyage Of Le Randonneur! 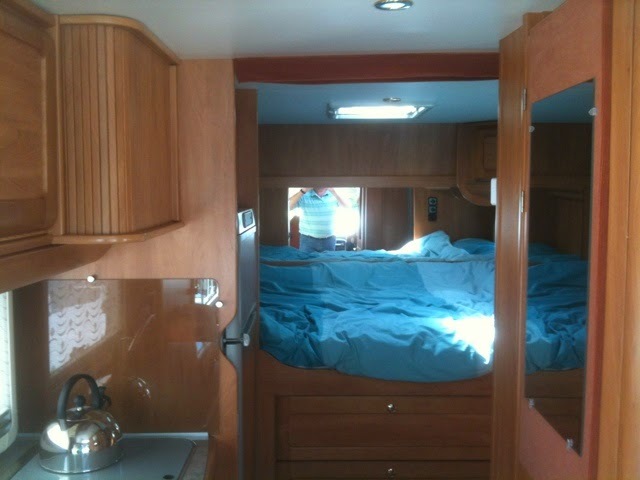 That is in our new motorhome of course, and what a weekend - hot sunny days. 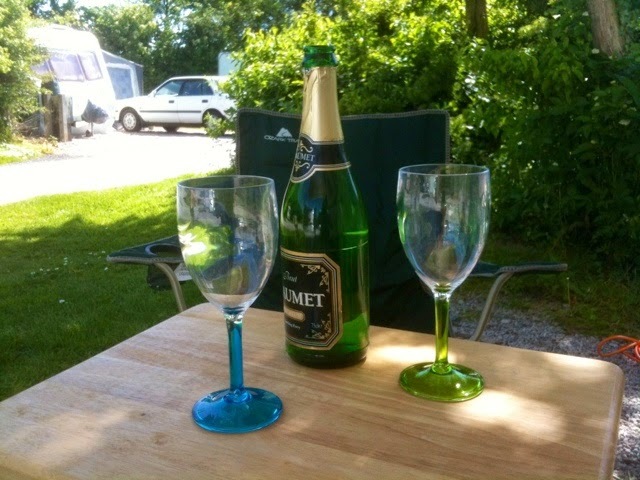 We have owned three touring caravans previously, but the last one of those was sold in 1989. In 25 years things have moved on a little. By the time we arrived home with our acquisition last week, the dealer had taken over an hour to try and describe how everything works. I thought it wouldn't be a problem, having lived with our narrowboat for the last 5 years. How wrong I was - these things are sophisticated. When we arrived home, I started to look into the more detailed workings of a modern A class motorhome. The heating is provided by a Truma gas / mains electric blown warm air system, including a fresh water boiler, complete with automatic temperature controlled dump valve to prevent freezing in cold weather. (That may sound contradictory, but the "garage" space where the boiler is kept is also heated by its warm air sister unit, so the auto dump facility is if I inadvertently leave it full while not in use and the weather freezes). Start-up is by selecting the desired type of heating and temperature on a rotary multi-function thermostat control, after switching the mains switch on if that is how you want it to run, rather than from gas. There is an additional heating system provided to the habitation space for use while travelling. This is taken directly from the engine via a heat exchanger with its own controls separate from the cab heater. There is a large Dometic Eco fridge freezer, which once turned on, selects its own fuel - either propane, mains, or 12V depending on what is available and is most efficient to use at the time. It is automatic, all you have to do is press the on/off button. Domestic fresh water is provided to modern hot/cold mixers in the kitchen, bathroom and shower, and is the usual pressurized system that we are all used to. While driving, the engine battery and two 110 ah leisure batteries are charged by the engine alternator in turn. Once moored up and connected to a mains supply, there is a multi-stage battery charger that takes over, again automatically. For "wild" camping we have a generator located in the rear garage providing there is no-one near to us who would be bothered by the noise. There is an on-board 120 ltr fresh water tank - with a dump valve, and a 100 ltr grey water tank, also with a dump valve, although travelling is allowed (in theory) with these 90% full. The other type of waste is dealt with by the usual Thetford cassette, with the fresh water flush being fed directly from the main water tank replenishing the Thetford's own sub-tank. Cooking is by a gas oven/grill and a 3 burner gas hob, both by Smev. We also have a Remoska for use once we are on site and hooked up to a mains supply. Not a slow cooker, but a fabulous all-in-one pan cooker that can deal with anything to produce a full meal for two in one go, and only uses a few hundred watts of power to achieve it. We wouldn't be without ours now - so versatile, and ideal for this type of use. There is now a flat screen 12V TV and DVD player safely tucked up in its own roller shutter cabinet complete with a slide out, revolving rail, so it can either be viewed from the lounge or from the bedroom. The aerial is on an extendable pole accessed from within the wardrobe, complete with 12V amplifier. It can be fully adjusted directionally from inside the van, also with an internal winding mechanism which changes its polarity from horizontal to vertical if required. A mains socket is also provided within the TV cabinet, but I considered a 12V TV to be more versatile - it is the one we used to use while travelling on our boat. All lighting is by warm LED. Gas is 2 X propane cylinders on an automated change-over system. So, where did we venture for our first outing? 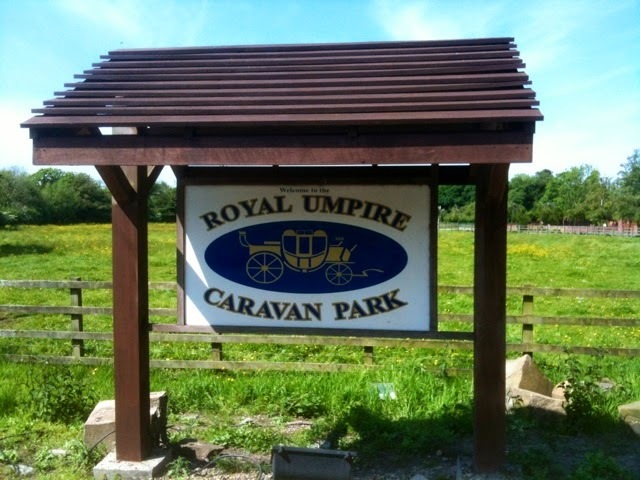 Royal Umpire Caravan Park, Croston, Lancashire, all of 20 miles from home, for just Saturday night. This place holds happy memories for us, as we used to bring our two young children here back in the 1980's, and I used to leave them all asleep as I left for an early shift in Wigan at 5.00 am during their school holidays. A very pleasant weekend, spent in rural surroundings - and now we know everything works on our Rapido 963f A class motorhome. Is My Motor Home Too Heavy? The subject of the maximum payload, or the total weight of you and your belongings within your vehicle's plated maximum gross weight is quite tricky to get a grasp of for the new motor home owner. Many owners will be merrily travelling the country completely unaware that they are possibly travelling illegally in one way or another. I will attempt to explain here, in relation to UK law of course, which also comes under the EU banner. There are current driving licence restrictions in the UK which restrict certain groups of driver to certain vehicles. What we are discussing here is a standard car license, which generally allows the holder to drive vehicles up to 3500 kg's gross weight, and motor homes in this bracket fall into the taxation class PLG. Motor homes between 3500 kg's and 7500 kg's gross fall into the upper taxation bracket of PHGV, and it is in this class that certain restrictions apply. Basically though, if like me you passed your driving test before 1st January 1997 you will automatically hold the entitlement to drive these vehicles until you reach 70 years of age, when a medical examination complete with a GP's letter will be required to renew it with this entitlement. Those who passed their test after this date will not hold the entitlement and will have to pass a further driving test to obtain what is known as Class C1 entitlement. Read more on the subject HERE. There is also a link to the UK Government website for further reading from there. Many new motor homes are rated at a maximum gross weight of 3500 kg's, as they will appeal to a wider market. This includes the current 2014 range of Rapido 8 and 9 series A class motor homes. See Rapido UK website. However, they can usually be specified with a heavier plated gross weight in order to provide a higher payload if required. This brings me to the buyer of a used motor home. If your ideal purchase is rated at the "standard" 3500 kg's, and you are able to drive a heavier vehicle, and that would suit your needs better, then all is not lost. The chassis that the motor home is built on is often capable of being "up-plated" without any need of modification, and is often just a paper exercise, with a new, higher rated vehicle plate being issued afterwards. More information on this can be found with this specialist company, SV-Tech. They are able to offer advice on how to achieve an up-rated vehicle. For example, each axle is plated at its own design weight. Adding accessories as simple as a bicycle carrier won't just add the weight of that and the cycles to the payload. As leverage also plays a part, the distance from the rear axle also has to be considered, and the actual weight added to the rear axle could be more than the actual weight of the accessory. "The unladen weight of a motor home includes the weight of the vehicle's standard equipment. Currently, unladen weight also includes an average driver (75 kg's), 1 X gas bottle, fresh water and fuel tanks up to 90% of their capacity with a tolerance of +/- 5% in accordance with European Directive EC 92/21. It is therefore the responsibility of the driver to adjust the load and limit the number of passengers on board according to the payload and the weight of any equipment that he/she installed or had installed in the vehicle". So, what have we bought. Our Rapido 963f, an A class motor home, built on the Fiat 2.8 JTD chassis is plated at a maximum gross weight of 3500 kg's. It leaves the French factory with an unladen weight of around 3100 kg's. 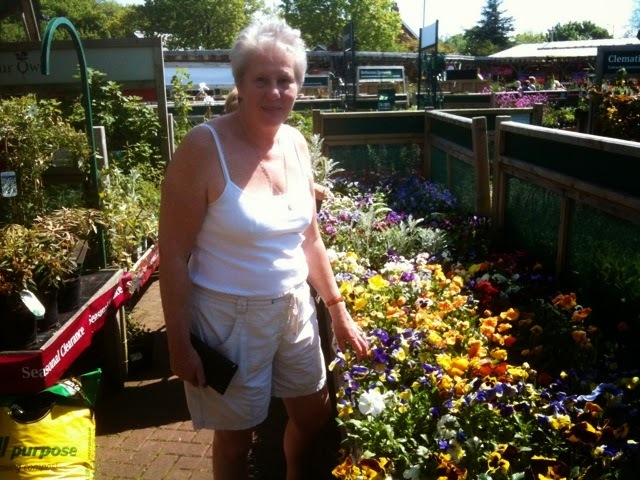 (While I am here, I would always recommend a potential new owner to have their new buy weighed at a public weighbridge to verify its weight before signing on the dotted line, as many things could have been done to the vehicle which would increase its weight, such as additional accessories. This would of course reduce the available payload). Back to our Rapido, which we have bought with the intention of possibly sharing with our son and his family. (He has a post 1997 car driving licence). Rapido motor homes are built for the European market, and don't come fitted with an oven/grill, as is quite common for Continental motor homes. Hymer, for example are the same. However, they can be fitted with what is known as a UK pack, to be sold here. This includes an oven/grill at 14.5 kg's, a living area carpet at 9 kg's and a Truma electric/gas blown air heating system at 0.6 kg's. Ours is also fitted with the ladder/roof bars accessory, which adds a further 10 kg's. All these weights have to be added to the factory unladen weight, and thus are removed from the available payload. The factory unladen weight of our 963f is 3160 kg's, including the weight of the UK pack, which gives us an available payload of 340 kg's. This unladen weight includes 90% of the tank levels and the driver only - additional passengers also form part of the payload allowance. The 963f was also available as a higher rated vehicle at 3850 kg's gross, which would give it increased payload, but would also place it in the PHGV taxation class, with the license restrictions. 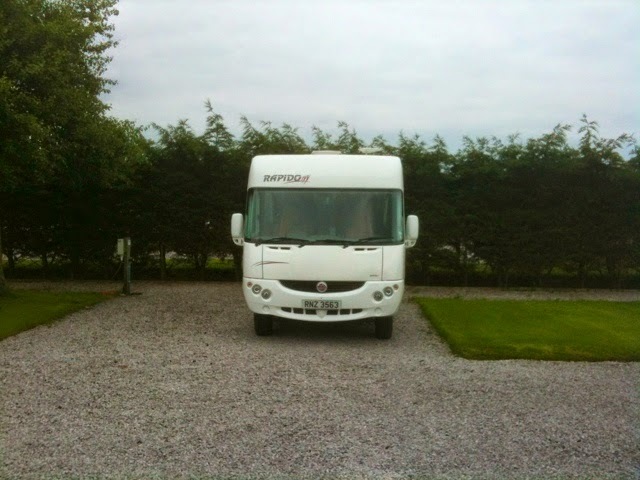 Rapido A class motor homes are usually fitted with a very large "garage" at the rear of the vehicle, as is ours. This could easily swallow a small motor scooter, but at around 100 kg's, would probably not be possible within our available payload. Consequently ours, with the standard plated gross weight of 3500 kg's will have to be closely monitored so as not to overload the plated rear axle weight allowance. As you will probably now see, this is a complex subject, and I suspect many owners will be driving around in their motor home blissfully unaware that they are overweight. I intend to load ours with everything we will take away with us, and have it re-weighed at our local public weighbridge. The alternative is to risk being stopped and weighed by one of the VOSA patrols, (now known as the Driver and Vehicle Standards Agency after March 2014), you often see lurking around our motorway system, with not only the inconvenience of not being allowed to proceed with your journey, but also having to fork out a large fine if you are found to be too heavy. Gross weight overall: 3340 kg - (Plated max gross weight is 3500 kg). Front axle weight: 1640 kg - (Plated max front axle weight is 1850 kg). Rear axle weight: 1660 kg - (Plated max rear axle weight is 2120 kg). So, we are well within limits, even when loaded, although Margaret's weight would also have to be included in the sum, but she's keeping that to herself. I might even consider an 85kg 50cc scoot for the garage now. The Pulse Scout 49 would ideally fit the bill both in weight and physical size for local transport once at our destination - I hold a full motorcycle license, but this would be a little different from my Yamaha R1 I had until a couple of years ago. The intended use for our motor home was always to use it to escape from the worst of the British winter. We take delivery this Thursday, but until we sort out our remaining obligations to our narrowboat, we intend to use it for the remainder of this year week-ending and holidaying throughout the UK. This should also allow us to get used to how everything works, as well as ironing out any teething troubles. However, once the end of summer next year comes our intention is to cross into mainland Europe to chase the sun, and the best place to do that at that time of year is Southern Spain. The area we have visited many times in the past is the only area within Europe to be officially designated as desert. The weather, including rainfall, that comes from the west is usually dumped over the Sierra Nevada's, leaving the Cabo de Gata Natural Park dry and sunny for most of the year. Our intended route will be via Brittany Ferries from Portsmouth to Santander, travel through Spain with an overnight stay around Madrid, to arrive at our destination after 4 day's travel in total from home, including the overnight ferry crossing.